FOSJOAS intelligent self-balancing scooter, as a trendy commuting vehicle, has come into people's life for some time. Does it bring any changes to people's life? First and foremost, FOSJOAS intelligent scooters offer people a choice to get around at any time and at any place. During rush hours, if there is a private car and an FOSJOAS intelligent self-balancing one wheel electric scooter, some people will choose FOSJOAS scooter instead of car without hesitation. It is because with the small and portable intelligent unicycle, people could never be dismissive of traffic jam. Meanwhile, FOSJOAS intelligent scooters will save a large sum of oil fees. There is also no pressure to look for parking space. In some fields of work, FOSJOAS could bring along efficiency as well as convenience. There are some deliverymen would do food delivery on FOSJOAS electric unicycles. They are so skilled at riding that the beverage will not spill out. The cool delivery service will surely attract more business. In exhibition halls and airports, some security staff would ride FOSJOAS intelligent self-balancing scooters to patrol. It saves their labor and is quite efficient to get around in a large area. Some customers even ride it to go shopping in malls. FOSJOAS intelligent self-balancing scooter is mounted with a super-silent maglev motor, even riding indoors will not disturb others. Some self-balancing scooter fans even walk dogs on FOSJOAS products. With an FOSJOAS electric unicycle, walking dogs will no longer be physical labor. Accompanied by an electric self-balancing scooter, the dog could take off on a pleasant journey with its owners on the wooded trails. Dog owners will not get exhausted. Life does get easier after owning an FOSJOAS self-balancing electric unicycle. More and more people enjoy riding for a green journey to the countryside on holidays. Freedom is what FOSJOAS brings along. It makes commuting more enjoyable. Life will be enriched when more and more people joining in green riding. 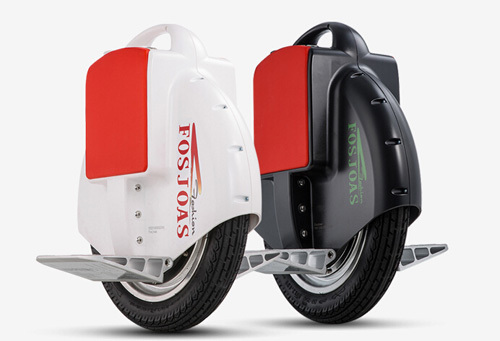 Previous：Which is the most popular electric self-balancing scooter of FOSJOAS?